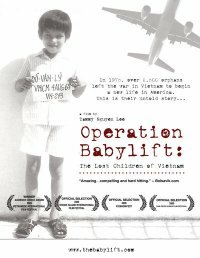 DALLAS, TX – Locally based non-profit ATG Against the Grain Productions will present the Dallas debut of Operation Babylift: The Lost Children of Vietnam at the inaugural filmAsiafest on Friday, September 25th at 7:00 p.m. at the Dallas Museum of Art. The award-winning documentary described as “Amazing…compelling and hard hitting,” by Bolsavik.com plays from 7:00 – 9:00 p.m., followed by a Q&A with the producing team. An added element that evening is a charity reception, Cocktails for a Cause, hosted immediately after the screening at the Dallas Center for Architecture, with guest musical performances by Mina Chang and cast member Jared Rehberg, along with a one-night only exhibit of the work of established and emerging Asian American photographers from around the country. Several pieces will be on auction to benefit orphanages in Vietnam. Operation Babylift: The Lost Children of Vietnam tells the significant, yet untold story of the $2 million U.S. initiative that airlifted over 2,500 Vietnamese orphans out of a war-torn country from the impending threat of the Communist regime. These adoptees grew up facing unique challenges in America, including prejudice overshadowed by a controversial war and cultural identity crisis. Featuring compelling and insightful interviews of the volunteers, parents, and organizations directly involved, the documentary takes a contemporary look at Operation Babylift and its relevance to international adoption today. Tickets to the screening will be sold online starting late August. Tickets to Cocktails for a Cause are available at www.AgainstTheGrainProductions.com. ATG Against the Grain Productions is a 501(c)(3) non profit organization dedicated to promoting Asian American cultural awareness through compelling media projects, while also raising funds for international orphanages. For more information please visit www.AgainstTheGrainProductions.com.